Mostly based on traditional catalogues, without further research, several modern parametric catalogues are nevertheless straightforward, without question marks, and easily misleading (chronology, epicentre, epicentral intensity, not to speak of magnitude). The example of an Ionian time-window (1658–1664), with several major events, shows that the historical seismicity of the Ionian Islands, often thought to be well-known, actually needs a more or less drastic revision. A wealth of sources was collected, mostly from the Archives of the Republic of Venice, then ruling the main three islands of the Ionian Archipelago; it was ascertained that there are no important chronological gaps in the surviving documentation. Similarly outstanding, and in fact at the basis of a more balanced and precise view of one of the events in this time-window, are the souvenirs of Christoff von Degenfeld, a German nobleman at the service of the Republic of Venice. His manuscript, discovered at the library of Karlsruhe (Germany) in 1992, has been consulted again in the original, on the occasion of the preparation of this paper. Some question marks remain on the distributions of macroseismic effects of the earthquakes within this time-window, and this is due to the lack of information concerning the mainland. For this reason this study does not propose epicentres and, of course, magnitudes. 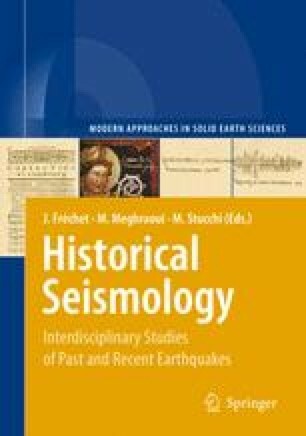 An unusually long documentary appendix is provided, with the hope that it might contribute in discouraging authors of parametric earthquake catalogues from hasty exploitation and interpretation of often unreliable current catalogues.